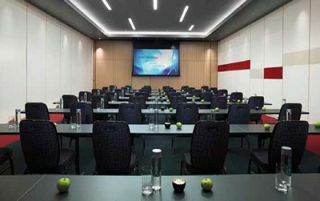 Crestron DigitalMedia provides the digital backbone for the conference center at the Revel resort in Atlantic City, NJ. The meeting rooms needed to be able to handle any analog or digital device, whether it’s a laptop with HDMI, DVI, or DisplayPort outputs, a Blu-ray Disc player, or some other device, including Apple devices, which Crestron easily distributes.With video converters available on Amazon for under $35 it’s easy to imagine that AV system designers and integrators are under considerable pressure to maintain margins and market share. Quite the contrary: with the “analog sunset”— in the wider sense, not just pertaining to Bluray Disc players—upon us, a bewildering array of formats and copy protection schemes to deal with, and 4K video coming over the horizon, AV professionals are sitting in the catbird seat. A.J. Shelat, vice president of sales at Hall Research, which makes video distribution, switching, scaling, conversion, and control systems, acknowledged that every AV equipment manufacturer has seen its product portfolio affected by commoditization. But, he noted, it’s not always apples to apples. Certainly someone could pick up an inexpensive display at Costco, but getting that display to work correctly in a system could be quite another matter. “Somebody is going to want to bring in some legacy equipment, and you’ve got the whole analog sunset taking place,” observed Shelat. The Hall Research EMX-HD-AUD resolves many system level HDMI signal-chain issues by acting as an intelligent intermediary allowing incompatible components to function properly.Entertainment content creators have lobbied successfully to restrict analog video outputs on Blu-ray players to prevent circumvention of HDCP copy protection. Further, some of the world’s largest computer makers have announced that they are ending support of VGA, beginning this year. Then, of course, there are the issues associated with HDMI systems, including not only the management and handling of HDCP but also EDID throughout a system. EDID may have been intended to streamline the connection of devices to displays, but if a component has no EDID implementation, there will simply be no image. Contemporary Research focuses on a workflow that keeps an AV expert in the equation on projects like Russell Investments in Seattle, WA (above).Contemporary Research focuses on the wireless distribution of HD, SDI , and digital signage content, a workflow that is not readily purchased from an online catalog. “That usually puts an expert in the middle of that equation; that’s our strategy,” said Engstrom. Indeed, Crestron is already getting out ahead of the next jump in technology, to 4K picture resolution. Scalers were integral to a system in the past, when different displays had different resolutions, observed Kennington. With virtually every display now supporting 1080p there tends to be less need for scaling. But 4K complicates the situation. “With 4K on the horizon, we will need to manage and distribute these higher resolutions. The ability to scale 1080p to 4K can be challenging, and will play a major role in how systems are designed and which products manufacturers and integrators will recommend,” he said.